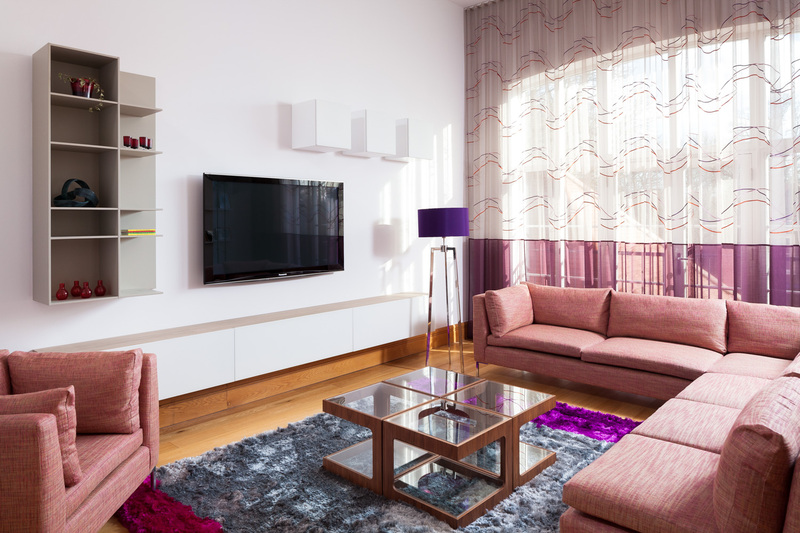 Modern, bright and airy to make the most of the light rooms and new large windows with added colour and patterned fabrics to inject interest and depth. Designs were needed for a number of key rooms in their home, with each space needing to flow together overall, but all have their own identity and uniqueness. 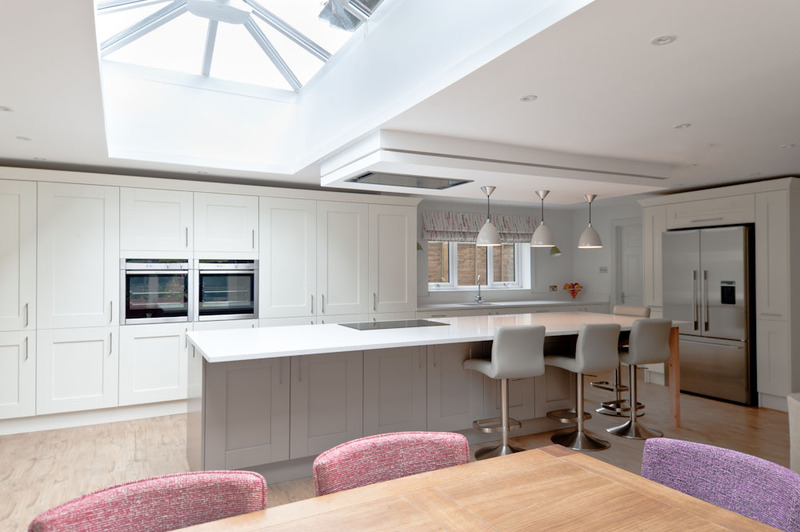 For the kitchen/dining room we created this beautifully subtle colour scheme, which compliments the large, light room, but adds in a real burst of colour without overwhelming the space. The muted blues and greys, with splashes of yellow and floral fabrics create a relaxing space, with a timeless colour palette that makes it perfect for breakfasts as a family or hosting dinner parties. 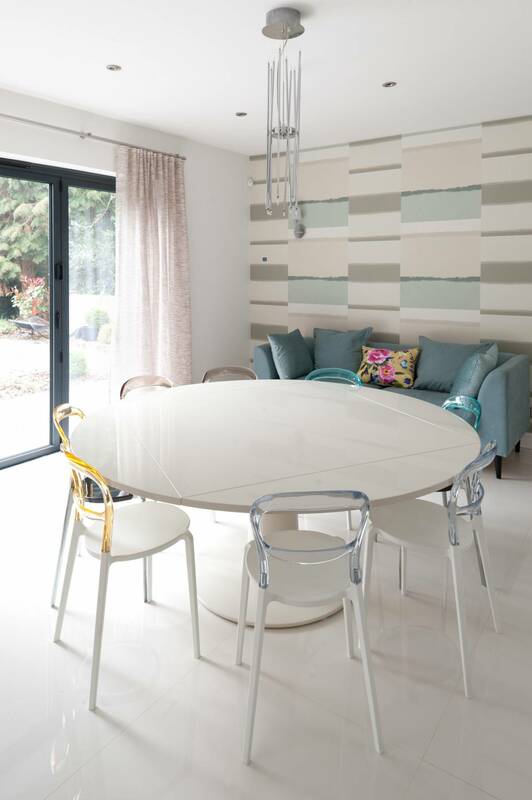 Clean porcelain floors compliment the high gloss table and chairs. 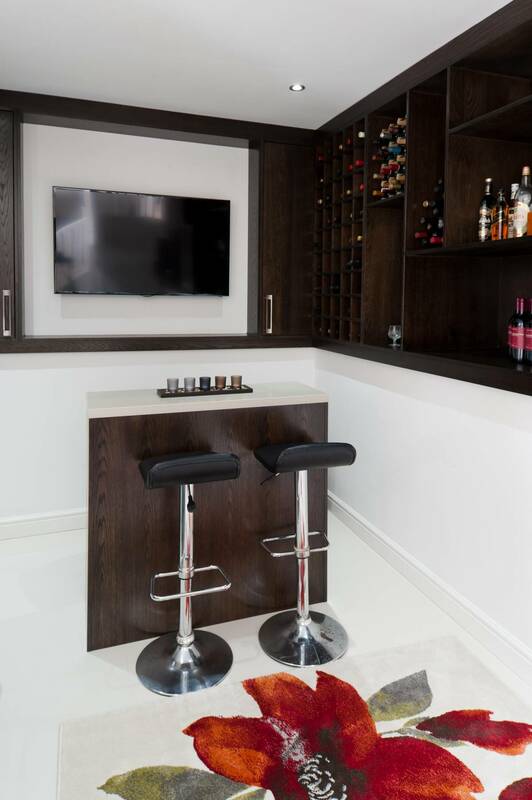 We created a slick bar area with stool seating, convenient storage for glasses and drink bottles, over looked by flat TV screen just perfect for watching sports and having a few after dinner drinks. When we started, the lounge was square space and tricky to layout. It backs on to the main stair case and sits in between the walkways to the main front door and stairs to the downstairs kitchen. 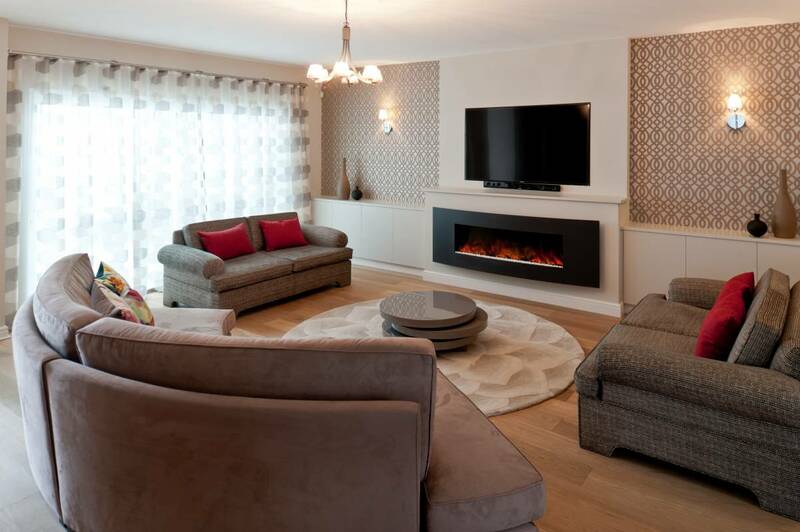 We started by adding a large striking fireplace under the flat screen TV to create an interesting focal point, detracting from the TV itself, but making sure that it was well positioned for viewing when needed. The key piece for the scheme is the large curved sofa we introduced to maximize the seating. This was the crux of the design as the shape and style of the sofa meant you can easily walk through to the other rooms of the house, and the curved shape provides a really social seating space, drawing in the two sofas either side to create a lovely relaxing space for the room just ideal for social gatherings and entertaining. 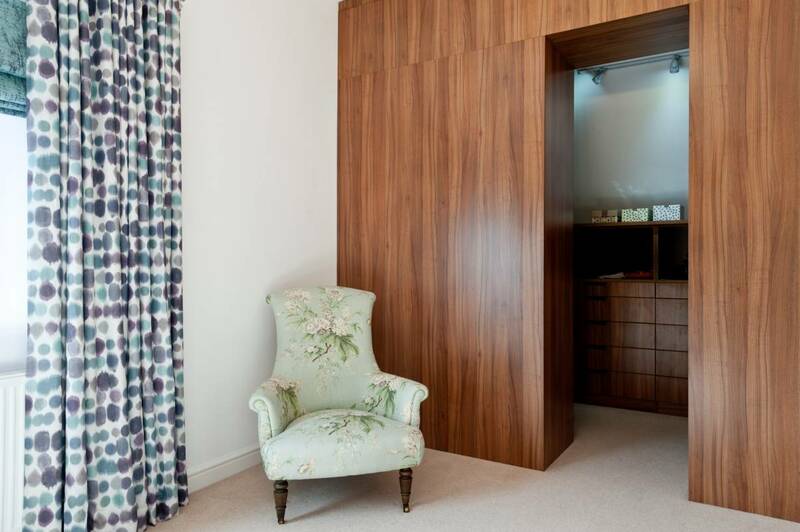 The use of a strong wallpaper pattern creates a real design feature in itself, to highlight key architectural details, as well as depth and interest to the room. 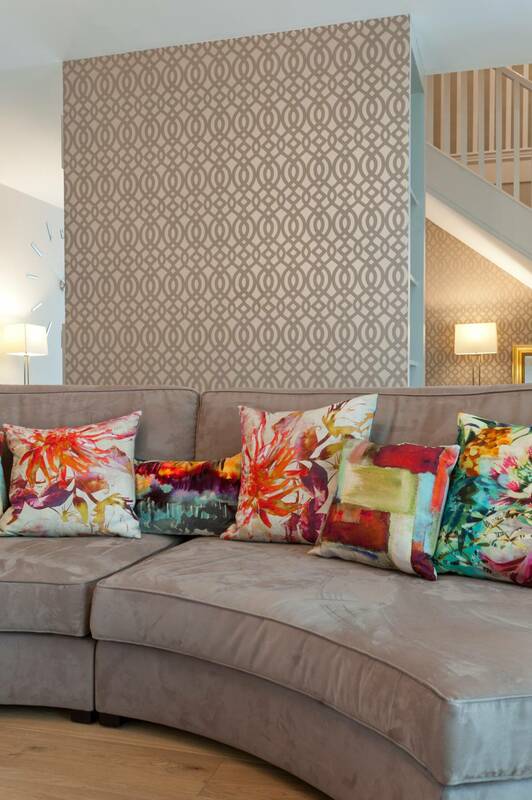 Strong colourful cushions from Boeme lift the room and show flare and character. 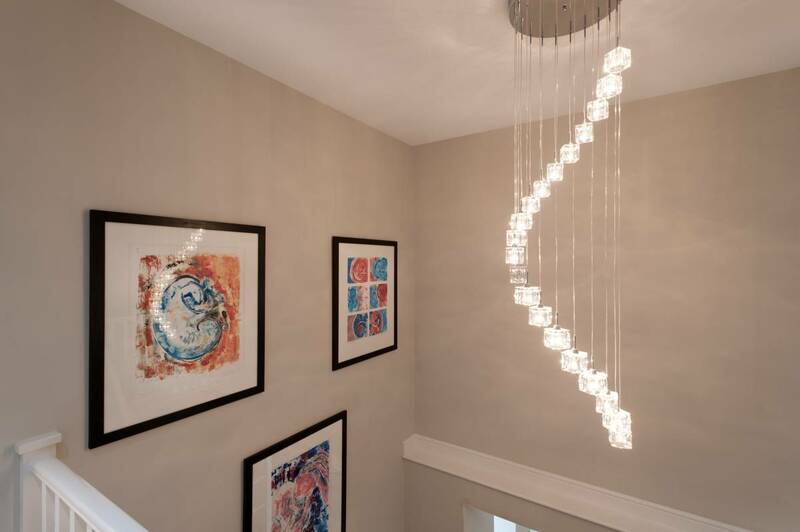 Our design recommendations flowed through the rest of the house – from displaying the client’s fantastic collection or art, to the window treatments and curtains throughout. We mixed a ton of suppliers together to create a really unique scheme – with designs from Romo Black Edition through to independent boutique designers based in the UK who produce the most beautiful and unique designs. The design of John’s home really does prove that less is more and choosing the right pieces and accents during the design process will not only create a stunning home, but also make the space totally functional too!